If you’ve got an adult who made Estes Rockets as a kid, you’ll definitely want their help when you start your own. The excitement that building rockets creates, the passion that you both can share… it will make your rocketry adventure that much more memorable. Suppose you already have your adult helper (if not, stop here and get one. You really can’t do this without adult help, because this project involves FIRE.) 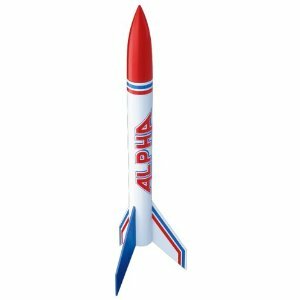 The first thing you need to do is order your Alpha Rocket Kit. You can order one online or find one at your local hobby shop. Since this experiment is a Bonus Experiment (it’s a more expensive project, and the parts are not typically in your local grocery store or hardware store…), the materials required are not listed with the main supplies for this set. Unfortunately, no – the rocket is something you have to purchase separately. Not everyone is able to launch rockets in their area, it’s something you have to get special permission for. The link actually takes you to a listing, and just the launch pad itself looks like the first one for sale. If I were you, I’d get the special deal that includes a rocket and wadding and everything you need (except engines), including another model rocket to build, because you’re going to lose or break a few the more you do this hobby! It looks like there’s a good deal on the Taser Rocket Launch Set or the Tandem X Launch set you might consider… look further down on the page. Hello, I’d like to order the parts for this experiment and I have a question. On the supply list is ‘Launch Pad with Controller’. Clicking on the Launch Pad link takes me to a launch pad on Amazon, but no specific controller. Is there a certain Controller we should buy? There is not a link for this. It’s a plastic snap-together rocket that is meant for kids that don’t know how to use glue. It doesn’t work nearly as well as the original alpha.